He was called the “Splendid Splinter,” stolen from the nickname given to baseball star Ted Williams. It wasn't original, but it was appropriate. He weighed about 145 pounds in high school, spread sparingly over his 6-foot-2 frame. Mr. Basketball in 1959, he was a harbinger of the go-go Sixties, when shooters were given a free rein to do their thing. 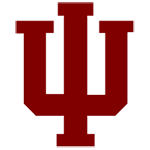 He scored 56 points twice for IU. One of those occasions was against Michigan State. He scored 44 in the other game that season against the Spartans for an even 100 in one season. Decades later, when Rayl was encouraging Michigan State coach Jud Heathcote to recruit Matt Painter, Heathcote called him. “Is this Jimmy Rayl, IU's all-time leading scorer?” Heathcote said when Rayl answered the phone. “No, Jud, I wasn't, but if I played you guys every night I would have been,” Rayl said. 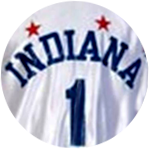 Rayl was voted the Pacers' Most Popular Player the first year of their franchise, and was a starter at the beginning of the following season. But he was released shortly after fellow former IU star and Kokomo resident Slick Leonard took over as coach. There's a story behind that which Rayl didn't want to get into here, but I'll write about it at some point. 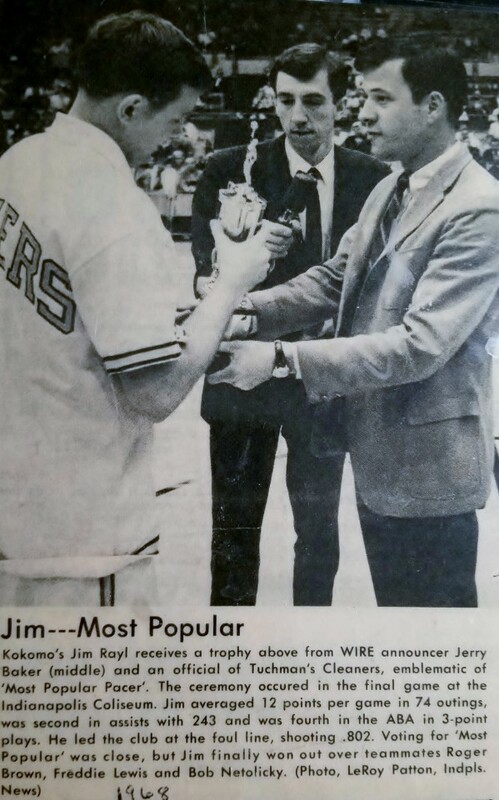 Rayl receiving the trophy for being voted Most Popular Player by fans after the Pacers' first season. A lot of good it did him. He was released abruptly early the following season. We conducted this conversation on the telephone, but I've visited with Rayl at his home in Kokomo. I saw the driveway where the goal used to hang on which the likes of Rick Mount, Scott Skiles and John Havlicek shot. I also saw the wood paneling in the basement that two of his Pacers teammates, Bob Netolicky and Mike Lewis, helped install. I've had a few lengthy conversations with Rayl since this show aired, and have learned a lot I didn't know at the time of this conversation. But this qualifies as a good start on the story.